The National Poverty Center at the University of Michigan reports that 14.1 million children lived in poverty in the United States, as of 2008. Nineteen percent of children under 18 live in poverty. The official poverty level varies according to household size, but in 2008 a single parent with two children met the definition of poor if family income was below $17,346, and a family with two adults and two children was considered to be living in poverty if household income fell below $21,834. Low family income affects children in different ways. Children who live in families at or below the federal poverty level have lower academic achievement scores. 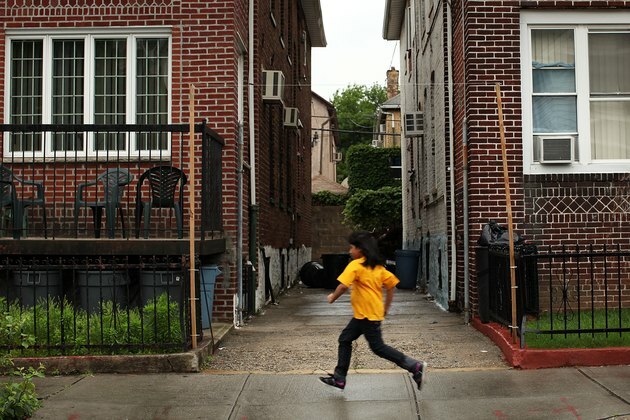 Poor children report to school behind their more affluent peers. According to the Connecticut Commission on Children, as many as 40 percent of American children, most of them poor, aren't ready for kindergarten by the time they reach the age of kindergarten enrollment. As children from poor families get older, they are more likely to drop out of school, according to Child Trends.org. Children in poor families often have parents who are less well- educated, may attend disadvantaged schools, and may have fewer enrichments such as books at home. The Connecticut Commission on Children reports that children who live in poverty experience more illness than children in more affluent homes. Poor children are five times more likely to die from infectious diseases. Babies born to low-income parents have lower birth weights. Low birth weight babies have a great risk of dying while infants. Poor children are also more likely to be obese and have a higher incidence of asthma. Child Trends.org reports that poor children experience more behavior problems such as difficulty getting along with other children, disobedience and impulsiveness. They may have lower self esteem and have higher rates of teen pregnancy. The Connecticut Commission on Children reports that children in low-income families are 1.3 times more likely to have learning disabilities or developmental delays. A 2006 study by Lisa Strohschein of the University of Alberta, reported in Science Today, found that poor children demonstrated more antisocial behaviors such as bullying, lying, cheating and breaking things.